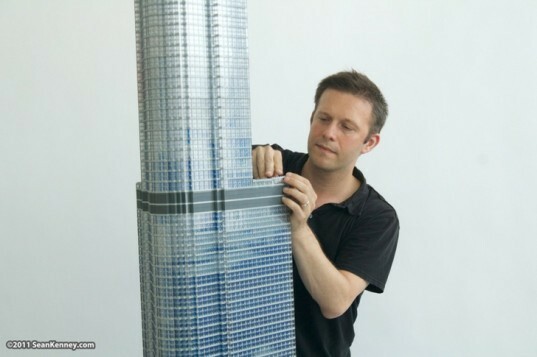 Sean Kenney Uses 65,000 LEGOS to Create a 10 Foot Tall Replica of the Trump Tower! There’s a new Trump in town -- and it’s ten feet tall! Chicago’s Trump International Hotel and Tower has been given the LEGO treatment, thanks to designer Sean Kenney. 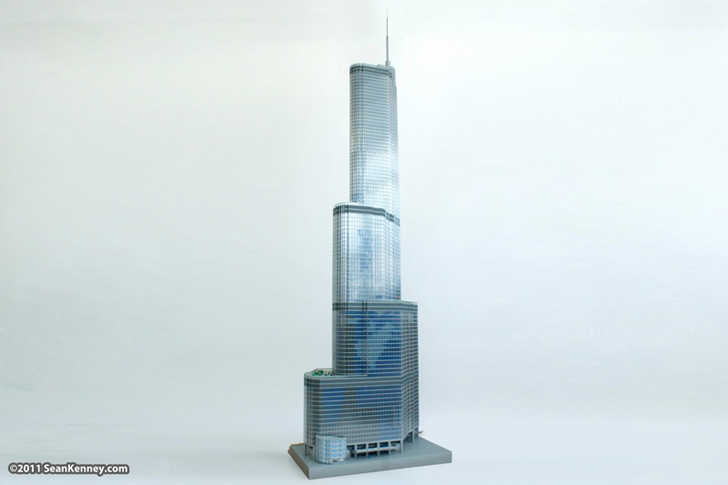 The LEGO expert has been creating sculptures from the children’s toy, and paying tribute to the country’s finest buildings over the last few years, choosing Trump’s Apprentice headquarters as his latest project and using 65,000 pieces to complete it! The Trump Tower may have been Kenney’s most difficult project to date, not taking into consideration its immense size. The actual building is covered with a skin of highly reflective glass, which blurs the façade into Chicago’s skyline. Attempting to replicate the reflective surface, Kenney developed a prototype to create the same visual effect. Since the original building is so tall, it mostly reflects the blue sky and clouds, as well as projecting distorted views of the buildings around it. Kenney’s solution was a complicated layering process. Building a thick base, also for structural support, he built up layers of LEGO pieces in blues, whites and greys. The inner layer depicts a pattern similar to a distorted view of clouds moving through the sky. For the outer layer, Kenney used clear LEGO bricks, creating the glass-like look. Combined together, the inner layer appears diffused and gauzy, successfully creating the illusion of depth and reflection. The tower, much larger than Kenney himself, took the artist and his assistants a month to tirelessly construct. Amazingly, it is held together just by the LEGO blocks’ patented nubs, no glue was applied to the tower (unlike some of his other projects). The magnificent result is on permanent display in Chicago’s LEGO Store- where even the biggest of kids can feel like King Kong standing next to it. The Trump Tower may have been Kenney’s most difficult project to date, without even taking into consideration its immense size. The actual building is covered with a skin of highly reflective glass, which blurs the façade into Chicago’s skyline. Attempting to replicate the reflective surface, Kenney developed a prototype to create the same visual effect. Since the original building is so tall, it mostly reflects the blue sky and clouds, as well as projecting distorted views of the buildings around it. Kenney’s solution was a complicated layering process. Building a thick base, also for structural support, he built up layers of LEGO pieces in blues, whites and greys. The inner layer depicts a pattern similar to a distorted view of clouds moving through the sky. For the outer layer, Kenney used clear LEGO bricks, creating the glass-like look. Combined together, the inner layer appears diffused and gauzy, successfully creating the illusion of depth and reflection. The tower, much larger than Kenney himself, took the artist and his assistants a month to tirelessly construct. Amazingly, it is held together just by the LEGO blocks’ patented nubs -- no glue was applied to the tower (unlike some of his other projects). The magnificent result is on permanent display in Chicago’s LEGO Store, where even the biggest of kids can feel like King Kong standing next to it.